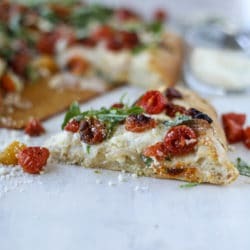 Slow Roasted Cherry Tomato Pizza with Garlic Cream and Arugula. This is my dream in a pizza! If you’ve been following me for a while, then you know that tomato sauce is certainly not my BFF. I never cared for it growing up and while I’ve always really loved pizza and even the traditional tomato sauce based pizza, I’d always pick white pizza if it was on the menu. White pizza it is! My taste buds are practically exploding just seeing this pizza again. It’s so packed with tons of my favorite flavors that I can’t even stand it. And here’s why! The recipe is inspired by a pizza that I love so much at Ironborn in Smallman Galley. The first time I had it, my mind was blown. The base is a garlic cream sauce which is so silky and perfect. But the additions on top are what really seal the deal for me. I’ve wanted to make it at home since my first bite and have been waiting for the perfect time. Let me tell you: the time is NOW. This post is in partnership with KitchenAid and I am so so so excited to tell you about some of the new appliances I’ve been using in my kitchen since the remodel. First, the slow roasted cherry tomatoes. AH! This is the best time of year for these. First, if you have some garden cherry tomatoes hanging around, you can totally use them here. But if your tomatoes are long gone and you’re buying tomatoes are the grocery store each week that are somewhat subpar, this is such an awesome way to use them up. It makes them so, so sweet and caramely and wonderful. And while it does take a while and makes the pizza a little more high maintenance than regular old pizza, we’re also adding caramelized onions to the top! They take a good 45 minutes or so to prep ahead of time, so you can knock both out at once. And this can all happen while your dough is rising, so it’s perfect. I slow roast the tomatoes in my KitchenAid® Wall Oven at 300 degrees for nearly two hours which turns them into tomato candy. Divine. It was almost difficult to put them on top of the pizza because, well… I just wanted to eat them right off of the pan. I love these wall ovens so much because I can completely trust them. They cook and bake every dish so evenly that it actually blows my mind. I never knew what a REAL oven was supposed to do, apparently. Ha! The preheating is done by their Even-Heat™ system and makes sure to remove ALL the cold spots in the oven. Which meant that every single one of my tomato babies was slow roasted to perfection! While it may not be a set-it-and-forget-it type of pizza recipe, the flavor more than makes up for it. It’s cheesy, caramely and sweet with a bite from the garlic sauce and some pepperiness from the arugula topping. I adore an arugula topping on my pizza. So often it comes with a deli meat, like topped on pizza with prosciutto and capocollo or something, which isn’t exactly my favorite. So to have the cool, crisp and refreshing arugula on TOP of the sweet and warm tomatoes? YES. Best combo ever. When it comes to the dough, you guys know that I’ve used my trusty pizza dough recipe for years now. I rarely ever use anything else. I use the dough hook on my KitchenAid® Stand Mixer to mix up the silky dough because it’s SO easy. I’ve always loved using the dough hook because the dough is more evenly kneaded and smooth than when I use my hands. And what’s so exciting is that I used to have to turn on my oven and set the bowl on top, but now, with my KitchenAid® Wall Oven, there is a proof setting! This was one of the main things I was looking forward to with this oven and it’s awesome. Works like a dream. I use it for pizza dough every week but have also used it for cinnamon rolls and pull apart breads and it’s so reliable. Like so much more reliable than my old trick of setting the bowl on top of the oven and waiting. For sure. Before, I’d inevitably end up “cooking” some of the raw dough because my system was so unreliable. Now, there isn’t even a possibility of that happening. Eddie just used it last week for the first time when he made pizza dough and his mind.was.blown. Next, we have this amazing garlic cream sauce. With this being your base, you don’t want to make it too far ahead of time. But the good news is that it only takes a few minutes. So once everything else is ready, go for it! A lot of you have asked about the cooktop we installed in the center island. In my kitchen remodel post I talked about how I’ve wanted one for ages because my grandma used to have one in her kitchen and I adored it. Being that I cook like a mad person (and tend to do large batch cooking days at once), I knew I wanted a BIG huge cooktop and there was never any doubt that I was straying from a gas cooktop. We installed this KitchenAid® 36-inch, 6 burner Gas Rangetop and it might have been the best decision of the entire kitchen. It’s huge and I use it every single day. It’s wonderful to be able to use four burners at once without things being crowded and crazy. The burners are large and come to temperature almost instantly, which I love since I’m an impatient millennial. There are two 20K BTU burners, three 15K BTU burners (which still are huge and cook things quickly under control!) and one smaller 5K BTU burner that’s for melting and simmering. I use that one all the time to melt butter and bring cream to a simmer. For the garlic cream sauce, I used one of the 15K BTU burners and it was done in a few minutes. Super smooth and creamy and ready to go right on that dough. I always keep a pizza stone in my oven and this hasn’t changed since my remodel. What has changed is how quickly my wall oven can come to temperature now because I make pizzas around 425 to 450 degrees F. It no longer takes an hour to come to temperature! The pizza bakes like a dream, as you can. How can you not want to devour that? Also, can we discuss how super easily these oven trays slide out?! I’ve dropped many a pizza on my hot hot hot oven floor (I even wrote about it in my first book!) so it’s nice to not really have to worry about THAT situation. 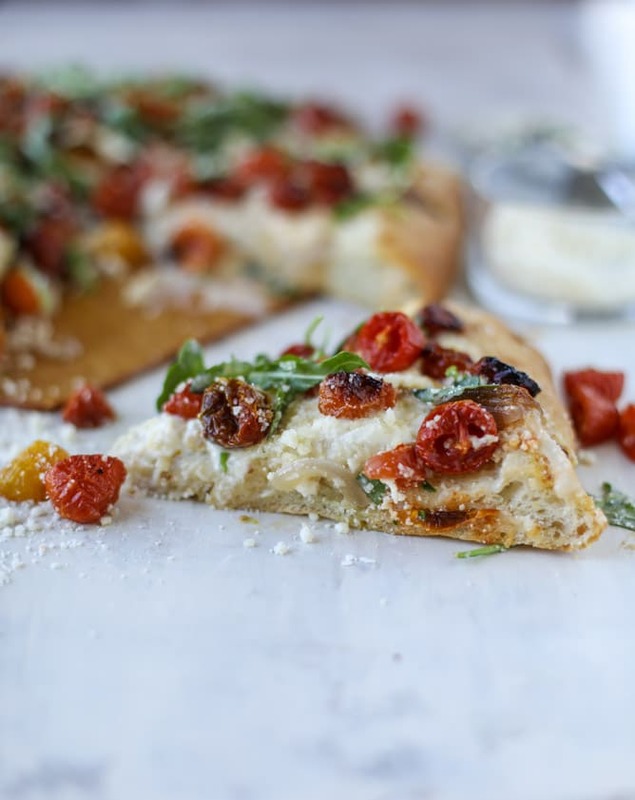 Once the pizza is baked and topped with arugula… oh my gosh. It’s such a major flavor bomb. It is so fantastic, so satisfying and really the only pizza I want to eat at the moment. In the bowl of your KitchenAid Stand Mixer fitted with a dough hook, combine water, yeast, honey and olive oil. Mix with a spoon, then let sit until foamy, about 10 minutes. Add in 2 1/2 cups flour and salt and with the mixer on low speed, stir until the dough comes together but is still sticky. Using your hands, form the dough into a ball and work in the additional 1/2 cup flour, kneading it on a floured surface for a few minutes. Rub a bowl with olive oil then place the dough inside, turning to coat. Cover with a towel and place in a warm place to rise for about 1-1 1/2 hours. Preheat the oven to 300 degrees F. Line a baking sheet with parchment paper. Place the cherry tomatoes on the sheet and drizzle with olive oil. Sprinkle with sugar and salt and toss well. Roast for 1.5 to 2 hours, tossing every 30 minutes, until the tomatoes are super caramely and shriveled and sweet. While the tomatoes are roasting, heat a skillet over low heat and add the butter. Once melted, stir in the onions with a pinch of salt and the brown sugar. Cook, stirring occasionally, until the onions get caramely and soft, about 35 to 40 minutes. To make the garlic cream sauce, heat a saucepan over medium-low heat and add 1 1/2 cups of the cream and the butter. Stir in the garlic. In a shaker bottle (or in a bowl with a whisk), shake together the remaining 1/2 cup of cream and flour. It will create a thick slurry. Pour/scoop it into the cream mixture and stir well. Cook for 2 to 3 minutes, stirring often, until the cream sauce thickens. Place the ricotta cheese in a fine mesh strainer and press it gently with a paper towel to release some of the liquid. Begin to make your pizza! Spread the garlic cream sauce into the pizza, leaving a 1-inch border or so around edges. Top with the ricotta cheese. Add the caramelized onions and the cherry tomatoes on top. Bake for 20 to 25 minutes (or around 15 to 20 minutes if using the pizza stone) until the cheese is golden and bubbly and the crust is golden. Remove the pizza and let is cool for 10 to 15 minutes so the center cream sauce can set. Top with the fresh arugula and slice. baby #2 at 37 weeks! Such a gorgeous oven and pizza!!!! Yum! I love how fluffy that crust looks! A proof setting? What amazingness is this!!!! Omg, I want one!!! Then I can make this pizza every day!! Garlic sauce!!? Yes please!! thanks leanne! the proof setting is perfect! OMG I literally saw the title of this recipe and was like she had to have gotten this idea from Smallman!! I’ve only been to it 3 times since Iron Born opened but omg, the garlic cream on this pizza is so amazing. Cannot wait to make this at home!!! it is so so so good! now i just need to learn how to replicate that incredible crust! Cherry Tomatos, Arugula, & Pizza? All my favorites, why haven’t I thought of this! OMG deliciousness!!!! This is all i want to eat for the rest of the week!!!! That’s a totally normal pregnant thing right??? The pizza sauce sounds amazing. Hubby is usually a tomato sauce fanatic but I’ll just sweet talk him into the white sauce when we get home. We always make our own pizza dough with our Kitchen-Aid mixer. That is one appliance that gets lots of use. Now, if you like a crispy crust you’ve got to get a pizza steel. Wow!! What a difference. We had stones in both our ovens but replaced one of the stones with a steel. Can’t wait to try the pizza. i am dying to try the steel too! This looks like fantastic pizza. Will need to take advantage of the last bit of farmers market cherry tomatoes for sure. And I love arugula as a pizza topping as well! And a proof setting on an oven? Jealous. That’s amazing. the proof setting it so wonderful! i use it every week! thanks breanne! This looks amazing and I am in total kitchen envy, especially over your oven’s proof setting! What kind of pizza stone do you have? thanks so much shannon! i can’t remember on the pizza stone – i think it’s actually pampered chef brand! it’s like a million years old! OMG, I literally saw the title of this recipe and was like she had to have gotten this idea from Smallman!! yessss that pizza is the best! thanks so much michele! yes, i still use that camera and ADORE it. i use the 50mm f/1.4 lens and the 100mm macro lens! Am I the first comment-er that actually made this piece of heaven called pizza?!?!? I’m almost as excited to review it as I was to make it – although I won’t compare it to my excitement to eat it, because hey, pregnancy appetite and recipe reviews just can’t compare. Jessica, I’ve been following your posts – and drooling over each picture – for several months now, but when I saw this pizza, I knew it would be on the menu for the very next day. No waiting. No thinking. Just making. Before I start, I will admit that I cheated and bought fresh dough from the local pizza store – but with nearly three hours of prep for the rest, it didn’t feel like a cheat by the time I was ready to serve up. So yeah, it did take a while – but every step was so easy, I can’t think of one reason this shouldn’t be a weekly thing. After I put the pizza together, I spent the baking time walking around my kitchen licking all the pots and pans. The tomatoes, the sauce, the onions… my one thought was, hey, where’s the salt in the sauce? It’s kinda bland. But then the pie came out of the oven and after impatiently waiting the prescribed 10-15 minutes, I was speechless. And not just because my mouth was full. All the parts of the pizza come together so amazingly well… I wouldn’t change a thing. Well, what can I say? When I’d stuffed myself to capacity, I went to the couch to wait… and came back for more as soon as I had enough room for one more slice. I know, I sound like a pig, but if you tasted this, you would understand… I promise! I’ve never understood the star struck mentality; they are just people, after all. Squealing like a rat ran over my big toe when I see George Clooney walking down the street? No thanks! Throwing myself on stage at a Keith Urban concert? No thanks. However, I think I just fell in love with you after making this pizza. I now understand star struck. I may never be able to visit PA for fear of running into you on the street. I may just squeal or throw myself down at your feet. Oh, I did add anchovies!